On a lovely summer day, a short while ago, Kristin Archer from I Heart Hamilton and I had a rendez vous meet up for our second lunch at Appleberry Café. Owner Opal Osiol was so sweet and cooked up an enormous amount of menu samplers for us to try out -so damn good! If you’re in the King East neighbourhood, I would recommend stopping in for lunch for the BBQ chicken, mashed potatoes, fried dumpling, or butter pan-fried salmon (those were my favs). Yum! You can also read about our first visit to Appleberry Café from I Heart Hamilton here and from me here. We wanted to check out two stores on Cannon Street -the recently opened O’s Clothes as well as the bright and fresh Relish Vintage. 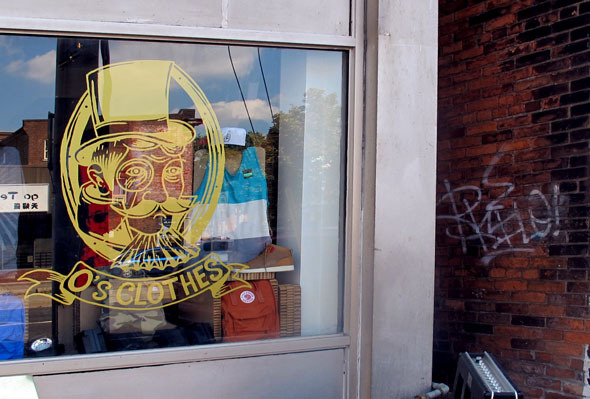 O’s Clothes is a sassy little addition to the corner of Cannon just a tickle east of James Street North. We stopped in to chat with owner Oliver Knutton about his new business. It was easy to strike up a conversation with Oliver -he puts himself out there and was happy to share his stories and thoughts with Kristin and I. When considering what type of store to open up in Hamilton his first thoughts were to open a record store but knowing Hamilton already has its fair share (Dr. Disc, Cheapies, Schizophrenic Records, Books & Beats etc.) he moved on to examine what that missing “je ne sais quoi” might be. Noting a gap in urban men’s street wear in Hamilton, Oliver told us he decided the time was right to take the plunge (like many other young entrepreneurs in the city) and open up shop. I follow O’s Clothes on Twitter (@OsclothesK) and love the instagram feed of photos he posts of his customers and their purchases. I asked Oliver if for the most part it’s his friends that come by to shop. He agreed that when the shop first opened just about two months ago his friends did make up a large portion of his clientelle but he soon found young guys from the neighbourhood -high school kids were dropping in picking up T-shirts, shoes and the like adding to his client base. You can tell the stores got an appeal for young guys. I loved how when approaching the store the “sandwich board” (which is actually a speaker) was pumping out some awesome hiphop -for sure a nice pocket scene I haven’t seen the likes of in Hamilton. In my younger days in search of something of this sort I’d have to have trekked it in to Toronto, to stores like Uncle Otis, Noise or Get Outside. Well no more… Hamilton holds its own! Oliver mentioned that after a fashion feature in The Spec titled The Shopper and as word of his store spreads he’s had visits from folks from all over the city and of all ages. Oliver told us of two recent sales to an elderly man (65+) who picked up a pair of funky-swish sunglasses because they reminded him of a pair of glasses he used to have in his youth. 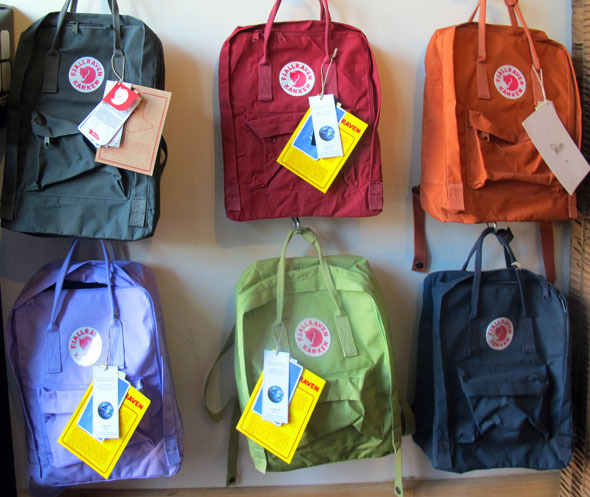 Another senior aged woman came by and picked up a gorgeous colourful Fjällräven backpack for her travels. So I guess it’s safe to say that O’s Clothes with their quality goods and apparel has got an appeal to not just the young folk but men and women alike both young and old. Colourful vegan friendly Borel belts to the right of the photo also come in dark green, grey, white and brown. I ask you -who else in the city carries vegan belts? 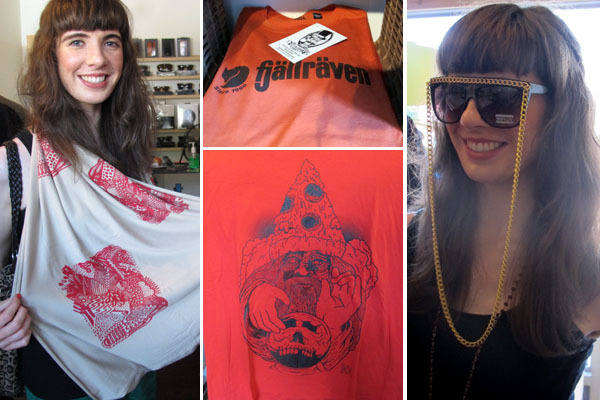 The lovely Kristin Archer from I Heart Hamilton modeling some goods at O’s Clothes. Oliver said that he’s making a special effort to carry local artist’s and designs in his shop. Top left Kristin holds up a beautifully printed scarf by Hamilton local Rebecca Duyzer (she had a little vintage U-haul store at the August Art Crawl and also has an Etsy store you can check out here). 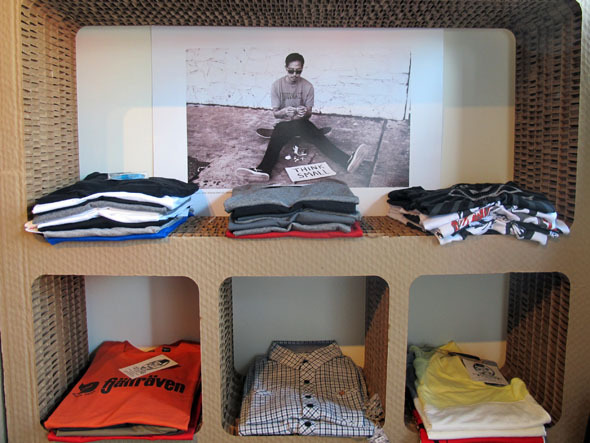 O’s Clothes also carries T-shirts designed and printed by Dave O’Connor like the centre image of the red Pizza Wizard T-shirt. Unique to Oliver’s store, besides the brands and clothes he carries, are his custom made corrugated cardboard shelves that he designed (take note the next time you’re by the shop). He says people often ask him about the shelves to see if they can get ahold of some -not only because they look super cool but also because they’re the perfect fit for storing a nice collection of vinyl. Oliver’s store, his personality and open friendliness was all round awesome. As Kristin and I checked out the goods friendly faces were popping in and saying their hello’s to Oliver. In just a few short months of being open O’s Clothes already seems like a pretty solid neighbourhood fixture. Had a great afternoon with Kristin from I Heart Hamilton chatting with Oliver. Kristin looks amazing in those sunglasses doesn’t she? Looking forward to doing another meet up with I Heart Hamilton again -so nice to have a partner in blogging from time to time. 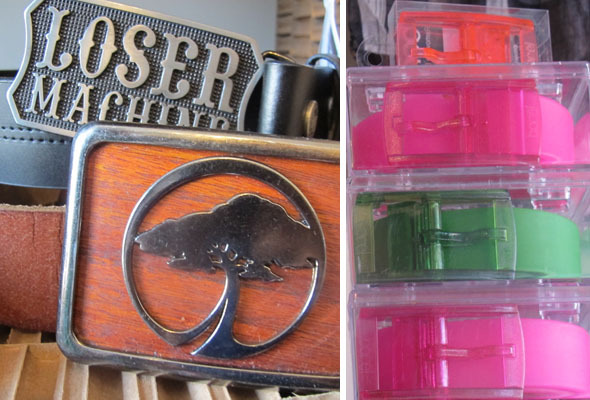 Don’t forget to check out I Heart Hamilton’s Post on O’s Clothes and Relish Vintage here! 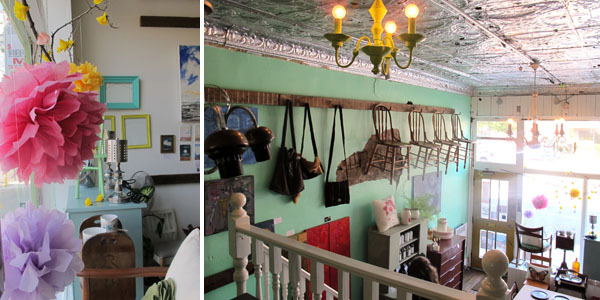 Our second shop stop on Cannon was to non other than Relish Vintage! Sometime ago when Downtown Bike Hounds had just moved to John Street, I blogged about the soon to open Relish Vintage (see that post here). Since Relish opened over a year and a half ago, I have of course been by the store many times but had yet to do a blog post (and I did want to do one!). So after Kristin from I Heart Hamilton and I visited O’s Clothes we decided we’d pop into Relish too to share some of our love for the shops holding it down on Cannon Street. Love the super bright green storefront exterior! 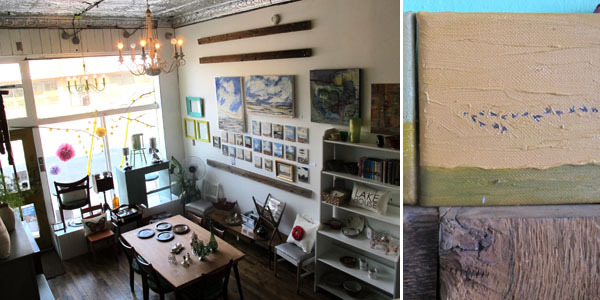 Store owner Katherine Hollands has a good eye for vintage finds and for selecting fabulous items from unique local designers. The store carries such a breadth of items that all seem to complement and work perfectly together. 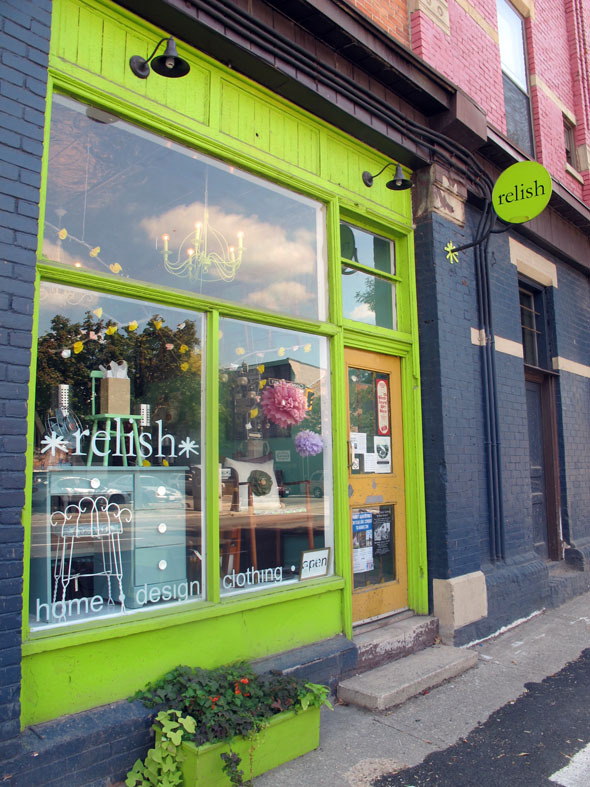 Relish has everything from refurbished vintage furniture to classic vintage dishes, greeting cards, wallets, bags and beautifully crafted Canadian made and designed clothes. Relish is often my go to place for when I need to find a unique gift for someone. I’ve bought a beautiful leather wallet, greeting cards, and a set of awesome Christmas cocktail glasses. 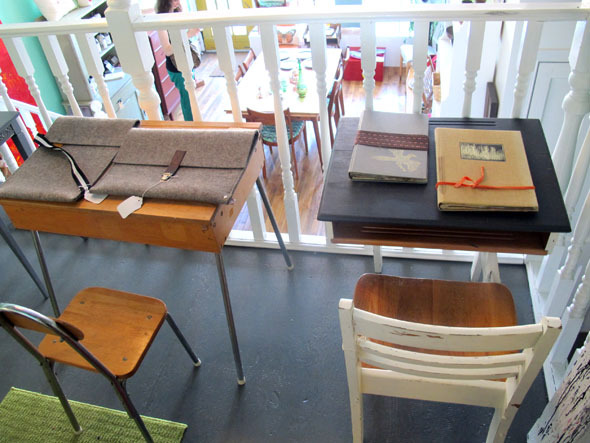 My friend Lindsay (of Hoot Furnishing) refurbished the desk on the right with a chalkboard top -selling for $75! Both desks are perfect for the back to school season. 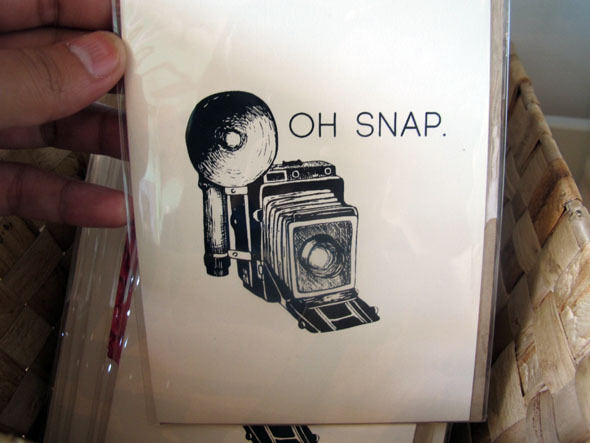 I also love the artwork that is for sale at Relish. The artwork on the photo above and to the right is by Sarah Holland. 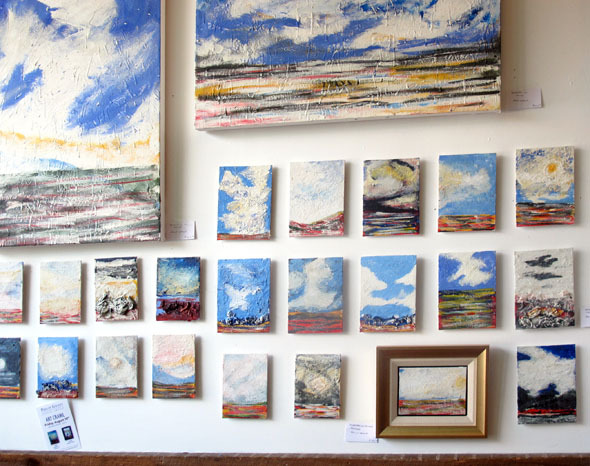 Her 4×4″ oil on canvas paintings are $25 a piece. Artwork by artist Philip Grant -encaustic on board (with frame) $120. Stop into Relish sometime there are always new things coming into the store. Say hello to Katherine you’ll likely see her in the store with her newest little addition to her family or with her adorable dog. 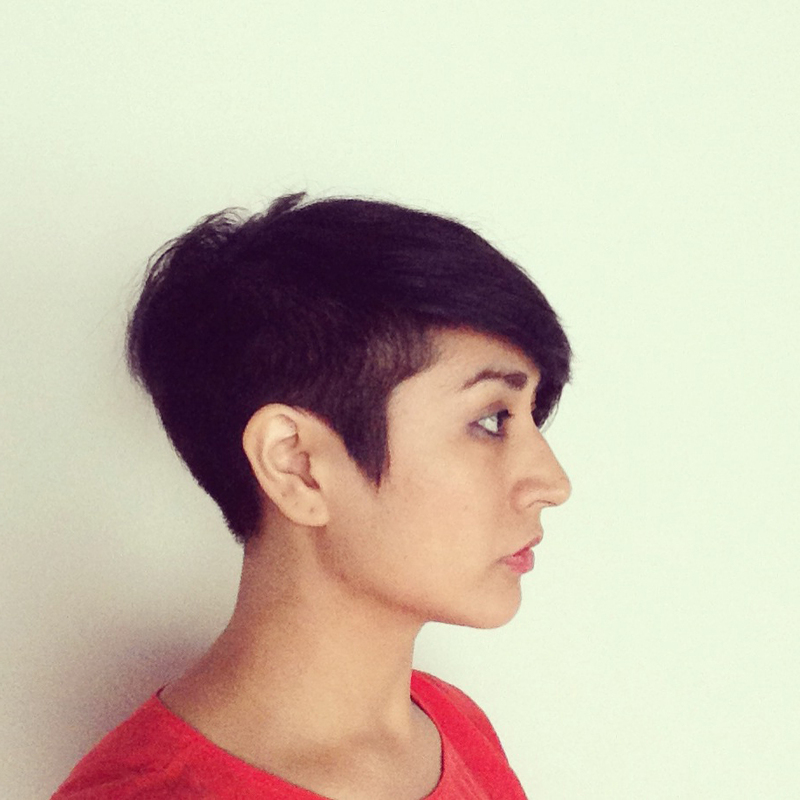 You can also follow Katherine via her blog Be Enamoured or on Twitter @RelishHamilton. 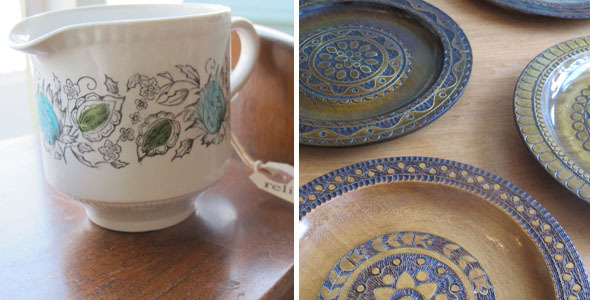 Relish is on Etsy too -you can check out the on-line store here. Loved touring the local shops and spots again with Kristin from I Heart Hamilton. You can check out her post here. Can’t wait up to explore together again Kristin! One of the reasons I chose downtown Hamilton as the place I wanted to live was because of its urban setting and accessibility on foot or by bicycle to key places located in the downtown core. Let’s face it, in southern Ontario there aren’t a lot of other city-living options besides Toronto, (the expensive and no longer affordable) where you can find a downtown core with beautiful surrounding neighbourhoods that make walkabiIity and living an affordable urban lifestyle possible. I like living in a way where my life is not dependent exclusively on a car, and where most amenities like the library, market, local bakeries, cafés, restaurants and useful shops are no more than a 10- to 20-minute walk away. All of these factors contributed to our choosing Hamilton as the place where we wanted to live. Growing up in Burlington and knowing a life dependent on car living, and having lived carless in Toronto, I knew Hamilton would fit the bill as an affordable, exciting and new alternative to Toronto city-living. 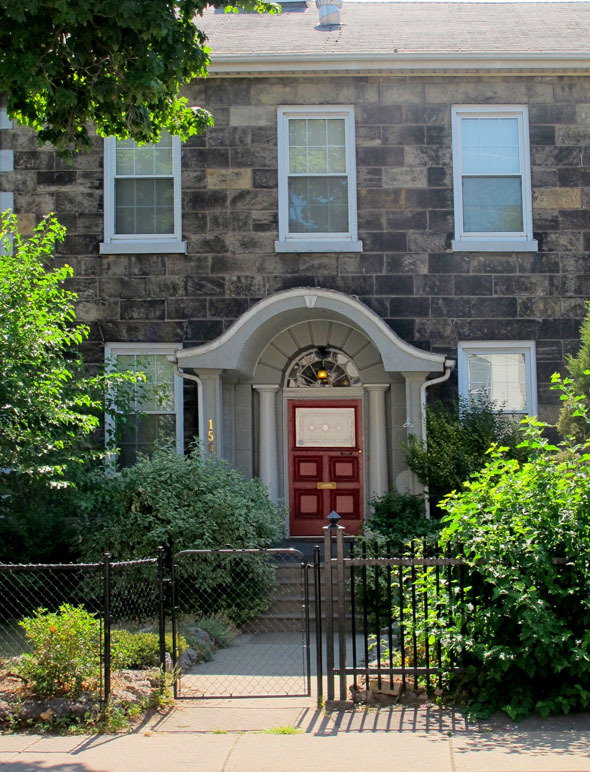 I was hoping to find a job in Hamilton but to be safe we bought our little Victorian row-house near the GO station just in case I had to bite the bullet and do the Hamilton-to-Toronto commute. I did try out the commute, and although not the worst thing in the world, I did feel like I was part of the rat race, and it was a race that I didn’t want to be running in. I remember being rushed by a crowd of what felt like thousands, and then being funnelled out of the turnstiles of Union Station and into the TTC subway station. And that was after having been abruptly woken up from a delirious and droolly early morning sleep-in on the train ride to work. I knew I just wouldn’t be happy being a commuter. Luckily, within a month of our move I landed a job in the North End a 10-minute bike ride away from home. Unlike when I was still living in Toronto and commuting to work 40 minutes just one way by bicycle, this new 10-minute bike ride was going to be more like a joy ride. Instead of battling through the busy downtown streets of Toronto, like I was used to, I was able to make my new morning commute in Hamilton a casual and enjoyable one. I took the side streets all the way down to the North End — even though I had to cross a few (OK, all) of Hamilton’s notorious busy one-ways. I loved this commute and my new job and so it reconfirmed that our decision to move to Hamilton was a good one. I felt that my standard of living had increased by being able to bike or walk to work. Every day I biked home to eat lunch together with my work-from-home freelancing partner. On nice days we’d eat lunch in the back yard or meet at the market or Mulberry for a coffee. It was such a nice way to break up a 9-to-5 work day. On my daily Hamilton commute, my favourite route to take to work was down Mary Street from King Street. In just the few short pedals it took me to get to work, the cityscape would change from the classic downtown buildings facades of King Street, through an industrial mix of old factories and houses, and finally to the distinctive North End residential neighbourhoods. I loved seeing the history of the city unfold as I passed through these diverse-cross sections of town. 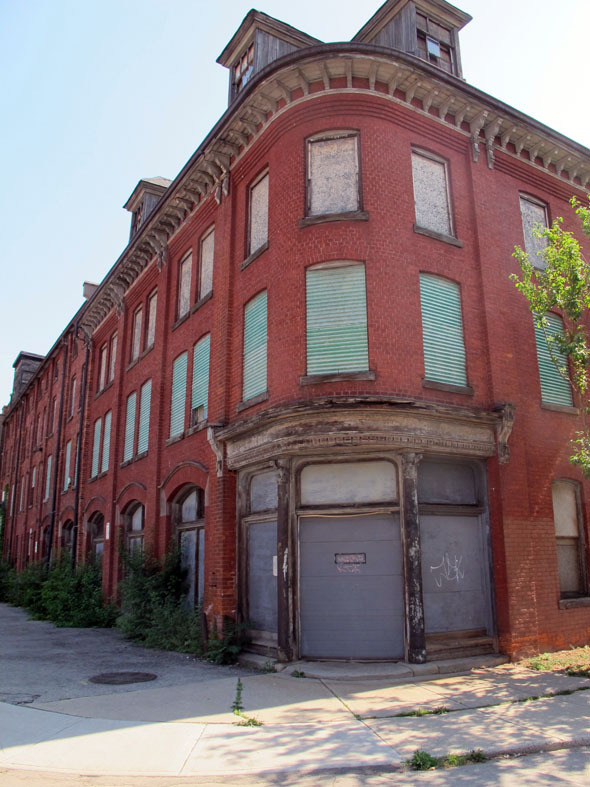 While pedalling, I would imagine what I would do, if I had millions, to develop some of the vacant buildings that I noted on my ride to work. One of my favourites was the old Century Theatre. I loved that building and was heartbroken to see it torn down. I had dreamt of a day when it would be gloriously refurbished. 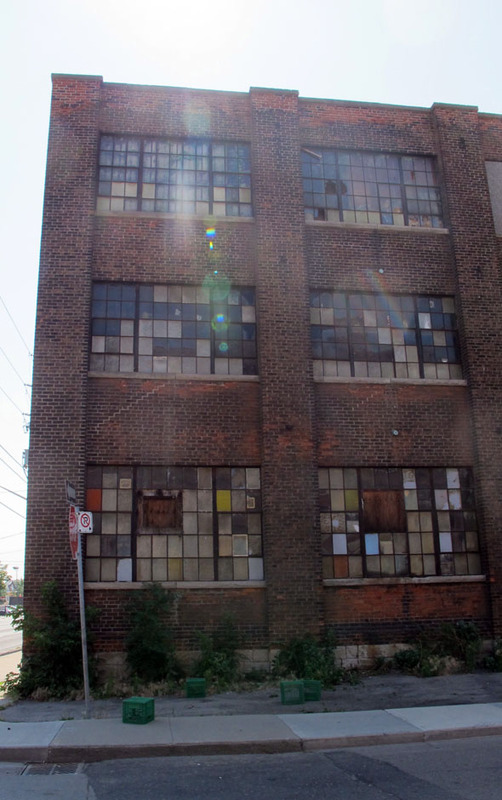 I was also in awe of the old Cannon Knitting Mills on Mary between Cannon and Wilson streets. What a building! 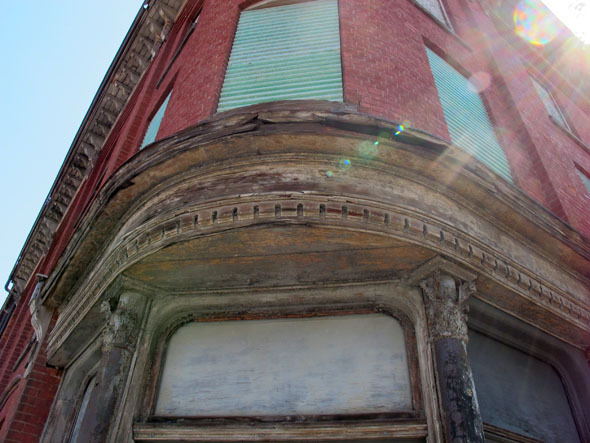 I adored the wood curve of the corner window and always imagined a potential café or storefront on that south-west corner of the building looking out onto Beasley Park. 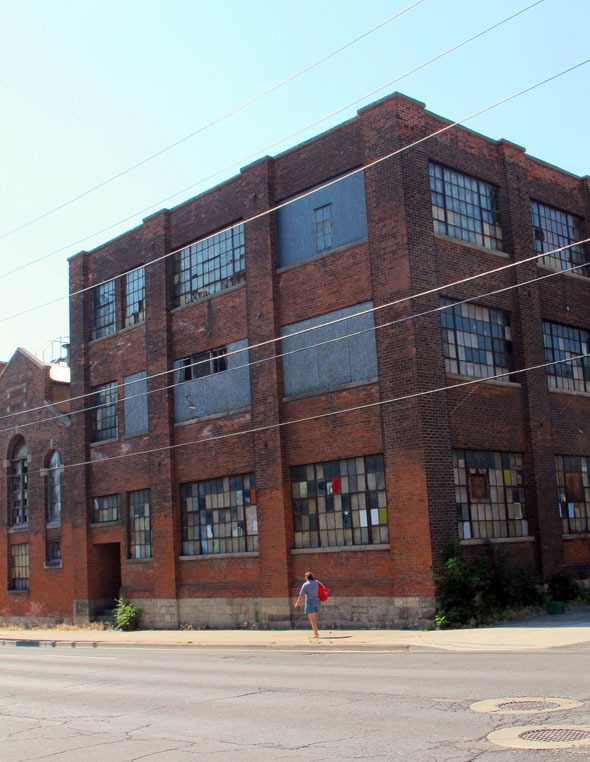 I dreamt that artist studios might one day transform the space similar to the studio spaces that have opened in the old cotton mill factory of 270 Sherman. 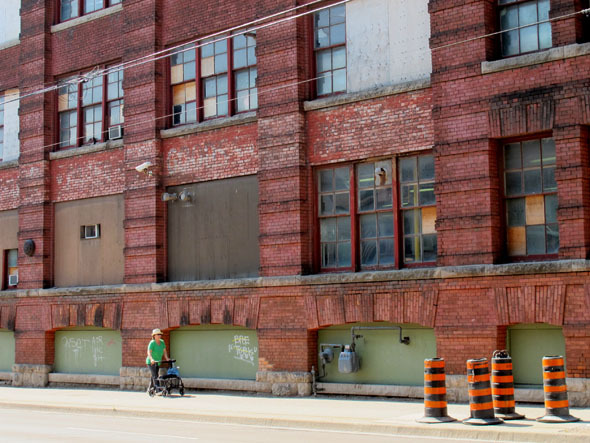 Or what if McMaster or Mohawk bought the space to develop a downtown campus focusing on the arts? It’s still sitting empty. 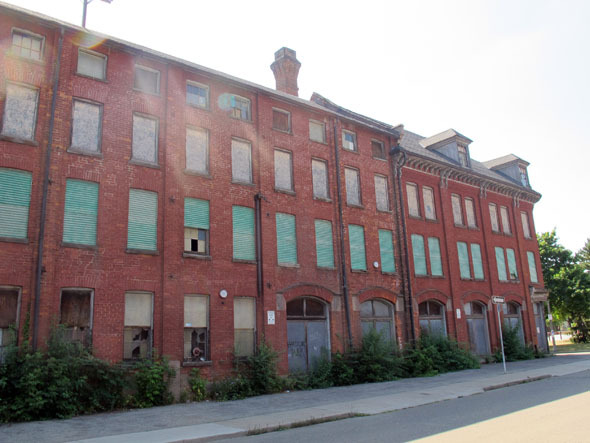 There was a small glimmer of hope when the space was suggested to the Hamilton-Wentworth District School Board as an alternative relocation space to remain in the downtown core, but to no avail. I still have dreams of the potential future of that building. Maybe one day? 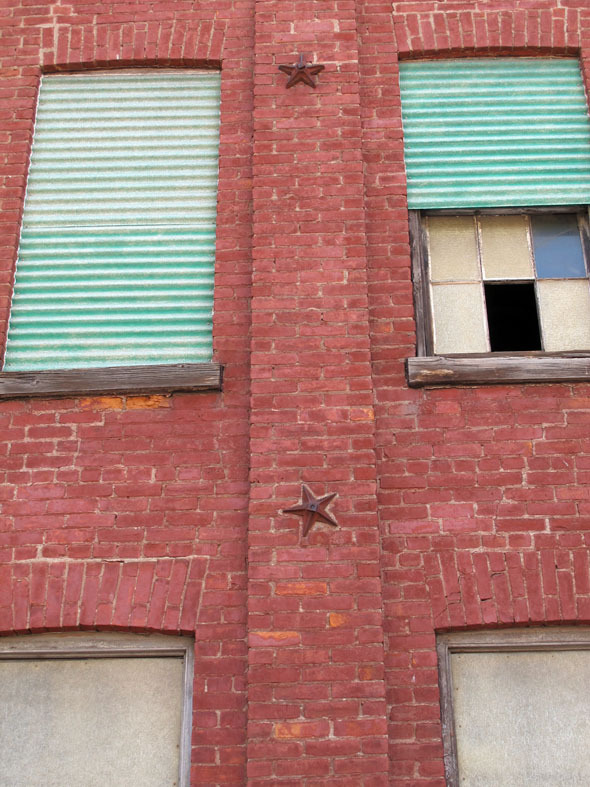 The following are a series of photos of the old Cannon Knitting Mills. I’ve heard that there are plans to redevelop them. Check out the link from The Mills, Innovation Exchange here. So exciting!! The intersection of Mary and Cannon streets is an interesting part of town. The Good Shepherd on one corner; undeniable evidence of some of the needs present in Hamilton, with early morning lineups of people waiting to access the food bank. Kitty-corner from the Good Shepherd is the fabulous 157-year-old stone William Pring House, recently purchased by the Ritchies, who run the Hamilton Guest House. And of course the unforgettable old knitting factory standing vacant on the opposite street corner. Pre confederation wood home on Mary St. If you haven’t been by these neighbourhoods check them out. 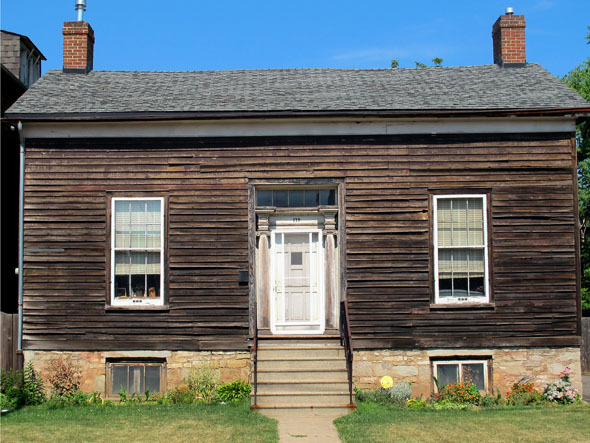 They are home to diverse urban landscapes and some of Hamilton’s oldest homes and buildings. This post was originally printed in The Hamilton Spectator on Saturday, July 15th and can be found here.